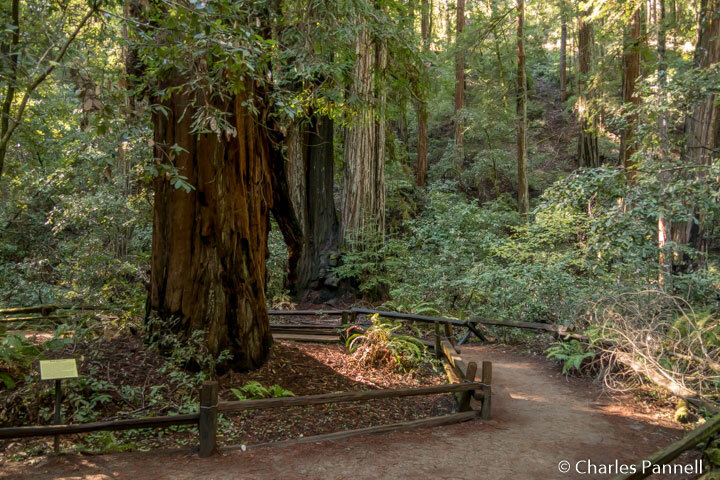 Located about two miles north of Guerneville, the Armstrong Redwoods grove offers people of all abilities the opportunity to get a closer look at these giant Sequoia sempervirens, more commonly known as coast redwoods. Originally set aside as a botanic garden by Colonel James Armstrong in the 1870s, today this California natural reserve is managed by the state. And although not all the trails through the forest are barrier-free, there are still a variety of choices for wheelchair-users and slow walkers. Getting to this secluded grove is easy. From Highway 101 take the River Road exit in Santa Rosa, then go west until you reach Guerneville. Make a left at the second stoplight in town — Armstrong Woods Road — and follow the road until it dead ends at the grove. Accessible parking is located near the visitor center, with ramp access up to the front door. Inside, there’s room to maneuver a wheelchair through the small bookstore, and up to the information desk. Accessible vault toilets are located behind the visitor center (on the right side); however some manual wheelchair-users may need assistance getting up the asphalt path. There are also several standard picnic tables on a level area in the parking lot. 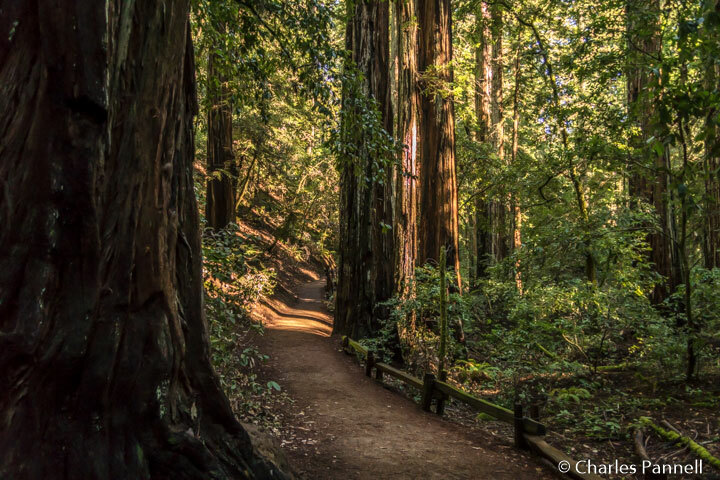 From the visitor center, it’s just a short level roll across Armstrong Woods Road, past the entrance kiosk, to the Pioneer Nature Trail — the most accessible route through the grove. For a comprehensive look at the grove, take the 3/4-mile Pioneer Nature Trail to the Armstrong Nature Trail. This hard-packed dirt and asphalt trail is wide and level and is rated as wheelchair-accessible. It leads past the tallest tree in the grove — the Parson Jones Tree — which measures more than 310 feet tall. From there the trail continues through the Burbank Circle to the Icicle Tree, which bears an unusual burl that resembles the namesake frosty formation. From this point, you can continue along the trail for another .1 mile to the accessible picnic area, or turn left on the .3-mile accessible Armstrong Nature Trail. The Armstrong Nature Trail crosses over Fife Creek and continues along on the opposite bank. It’s a tad narrower than the Prairie Nature Trail, but it’s still very doable in dry weather, and it offers a pleasant route through the fern-lined forest. The trail ends at the 1,400-year old Colonel Armstrong Tree, which is the oldest tree in the grove. From there, take the accessible Discovery Trail .2 miles back to the Pioneer Nature Trail, and circle back out to the visitor center. Along the way, don’t miss the ramp up and around one of the massive trees in the grove. The total length of this loop is 1.3 miles, and it’s all barrier-free. If that’s too long of a walk, you can cut the distance almost in half by driving down Armstrong Woods Road and parking in the accessible parking spot near the Burbank Circle. From there you can follow the .7-mile loop past the Icicle Tree, to the Colonel Armstrong Tree, and then back to the Burbank circle via the Discovery Trail. And if that’s still too long, you can take a .4-mile round-trip stroll to the General Armstrong Tree from the Burbank Circle, along the Discovery Trail. Alternatively you can drive the entire .6-mile length of the Armstrong Woods Road, which leads through the grove and dead ends near the volunteer office. It’s a short drive, but since the road bisects the grove, it offers some excellent windshield views along the way. And if you’d like to stop for a lunch break, accessible picnic tables are located near the end of the road, close to the accessible parking area. Last but not least, you can also drive to the Colonel Armstrong Tree. Just bear left at the entrance kiosk and take Redwood Forest Theater Road, which dead ends at the tree. There’s accessible parking at the end of the road, and it’s just a short level walk over to the tree. 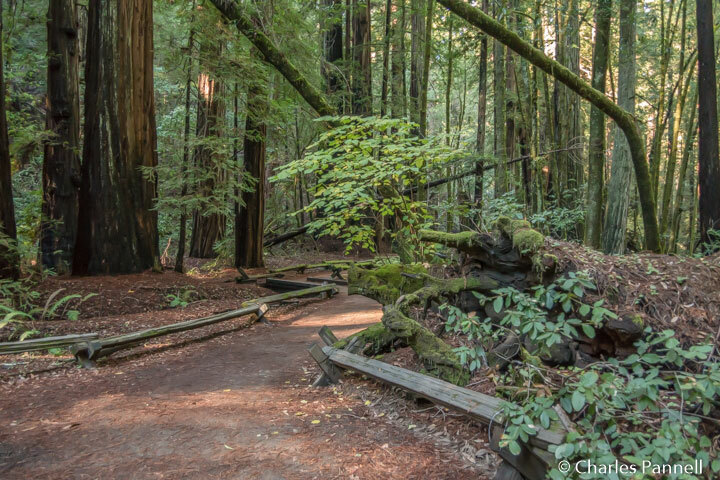 In the end, it’s all about choices at Armstrong Redwoods, as there are many accessible ways to see the grove. Just pick the choice that’s right for you, and get ready to be amazed by these stately giants.